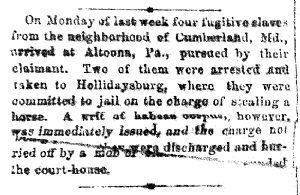 On Monday of last week four fugitive slaves from the neighborhood of Cumberland, Md, arrived at Altoona, Pa., pursued by their claimant. Two of them were arrested and taken to Hollidaysburg, where they were committed to jail on the charge of stealing a horse. A writ of habeas corpus, however, was immediately issued, and the charge not… they were discharged and hurried off by a mob of … the court-house. On Monday, April 6, 1862, a man named Spriggs from Cumberland, MD came to Altoona to arrest 3 or 4 fugitive slaves for running away and stealing a horse. The constable encountered the group in town; one of the slaves and a woman was captured, the others fugitives were able to escape. Those who were captured were taken to Hollidaysburg and placed in jail. The crowd that gathered during the chase, arrest and the journey to Hollidaysburg grew larger and became agitated and loud. Some were arguing for the slave owner, others were arguing that Spriggs had no authority to make this request from the Constable. The man and woman were brought before Judge Moses and he determined that there was not enough evidence to hold them for trial. Spriggs may have been a slave catcher, rather than a slave owner who was loyal to the Union. The ex-slaves may also have been “contraband” who came to Altoona after being freed by the Union Army. Altoona Tribune, Thursday, April 17, 1862, pg. 3. This information is courtesy of Harriett Gaston of the Penn State Altoona Campus and Jeannine Treese of the Blair County Historical Society. The Altoona paper names the man from Cumberland, a slave owner or slave catcher, as Spriggs, and there was a Joseph Sprigg from Cumberland listed in the 1860 Slave Schedule as owning 18 slaves.